User warning: You have an error in your SQL syntax; check the manual that corresponds to your MySQL server version for the right syntax to use near &#039;)&#039; at line 3 query: SELECT node_data_field_cat_category.field_cat_info_value AS category FROM node node LEFT JOIN content_type_category_info node_data_field_cat_category ON node.vid = node_data_field_cat_category.vid WHERE (node.type in (&#039;category_info&#039;)) AND (node.language in (&#039;en&#039;)) AND (node_data_field_cat_category.field_cat_category_value = ) in _db_query() (line 169 of /home/gotaormi/public_html/includes/database.mysqli.inc). Brand new property for luxury ski break. Casa Güejar Sierra is a new 3 bedroom townhouse situated in Guejar Sierra and a short drive to the ski resort. 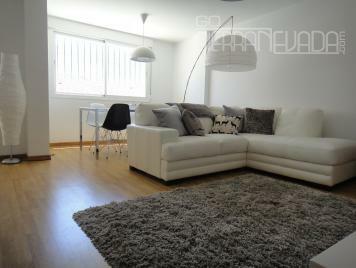 The property is furnished to a high standard with plasma TV/DVD, Wii games console and table tennis in the basement. There is a fully equipment, modern kitchen and 3 beautifully furnished bedrooms. The large garage/basement is perfect for storing ski equipment. There is a large lounge/dining area with open fire, perfect for winter evenings. There are numerous bars and resturants in the village together with a ski hire shop where the prices are considerably cheaper than in the main ski resort itself. Prices listed are aimed at those visiting for a weekend ski break, however we do offer a discount on bookings of 7 nights or more.